This morning I am keenly feeling my stripes. My husband says I’ve had “rock star” access to almost every specialist you could find for my complicated Ehlers-Danlos condition. My neurosurgeries have been performed by arguably the most skilled and compassionate leader in the search for the most whole life for EDS patients. I see the best cardiologist. I’ve explored all the other aspects of this DNA mess including genetics, hematology, gastroenterology, mast cells, gynecology and autoimmune disorders. This list is not exhaustive, but it gives a small window into how systemic this disorder can be in some patients, especially those of us with mixed type EDS. Because of Danica’s early Chiari diagnosis and her first brain decompression failing I was thrust into a life of research and battles in a war I would have gladly given my own life for. I call Danica my first angel in this journey, because if it were not for her suffering and her bravery I may have never found my own diagnosis explaining the decades of pain I had already walked. I call YOU my second angels, because you helped my family and I untie impossible knots by listening, loving, praying, supporting financially and always Hoping. I sometimes wonder what it was like to be chronically ill before the internet. It has really only been in the last ten to fifteen years we have been able to search our symptoms before a doctor’s appointment or run to WebMD after a diagnosis and then find a support group immediately of people who have the same illness we have. We have access to medical research and journals that were only available in print and to a select few prior to the information age. We’ve become experts in ways even our best doctors cannot. More recently social media emerged. In addition to the wealth of knowledge we also have countless facebook groups, public and private, to ask questions about our diagnoses, share information on the best physicians and our experiences with them, post imaging and swap medical articles related to our illnesses. We have hashtags for our conditions. We create YouTube videos to raise awareness and give others outside our sick community a window into what day to day life is like. We create fundraising pages to share and be shared in an effort to pay some of the exorbitant price of continuing our fight for the most whole life. 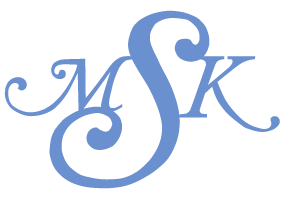 We have caringbridge pages to keep family and friends updated during surgeries and treatment and some of us have chronicled our journey with great candor through personal blogs. Just when HIPAA is cracking down even more harshly in medical settings, we, as patients, are going further and further down the road of willingness to open up about our personal health information with anyone and everyone who will listen. I was one of the early ones in some of these groups. There were just a few zebras who had gone before me. Now, there are thousands and more are being diagnosed every day. The awareness is working. One by one our general practitioners are learning through us we do not just have fibromyalgia, migraines and psych issues. We are fundamentally broken at the cellular level in a way that affects every part of our bodies. My old blog Team Danica had thousands and thousands of visitors because I was writing faithfully about our journey diagnosis by diagnosis in a narrative that explained this life in the reality of the pain but also through the lens of Hope. It documented the progression of comorbid conditions and the fight to see specialists who believed in their connection to EDS. Google search engines brought almost anyone typing in key words related to Chiari or EDS. People began emailing me and finding me on facebook and asking for help. I will admit in times when I was most ill I could not support all the people who needed help. I felt guilt but also sadness there was no place for them to go. A dear fellow Zebra created a private place on facebook called “Beyond the Measurement. Chiari, EDS, & Chiari w/EDS.” When I joined I know we had under 100 members. Today there are 2,609 members and exploding. It is a place of heroes rescuing heroes. I am proud of Robin Armstrong Griffin, her vision and the countless hours she donates to keep this safe and nurturing place going. My book, Gauntlet with a Gift, will be the first book in narrative form taking a newly diagnosed person through the journey in medical diagnoses and specialists but also through the mental, emotional, relational and financial struggles we fight daily. It is a beautiful and sometimes unbelievable story meant first for my fellow warriors, second for the people who walk along side us trying to understand, and lastly for anyone wanting to be inspired by hidden gifts in a gauntlet of suffering that truly has no end in sight. When I was in Texas on retreat one of the first people I met was a dear mom who has four children in the early stages of diagnosis and treatment. I was praying for affirmation from God about the direction of Gauntlet with a Gift. One of the reasons I wanted to attend this retreat was knowing Marilyn McEntyre was leading sessions. Her background in medical humanities made her a perfect resource for this work of love. Once again God answered exceeding, abundantly above all I could have asked or thought through this connection. The last day of the retreat, after we had spent rich time together on Saturday, she brought me her book Patient Poets. Illness from the Inside Out as a gift. She did not know I purchased this book from the Laity bookstore and had been pouring over it. I have already bought copies for friends and am giving one away here today. It explores the emotion behind our lives of pain and our fight for being just a little more well. The past week I’ve spent time on many phone calls with people all over the United States looking for the wisdom I’ve gained because I am steps before them in this fight. I have directed two local woman referred to me from friends who are very sick and desperate for a real reason. I know they have connective tissue disorders. Last night I logically walked a friend through the next thing she needs to do. She is a woman who knows all I do but has less support and different circumstances making her battle more fierce. When you can’t lift your head off the pillow it’s so hard to do the next thing. I am also watching my younger sister finally realize she has many of the same conditions. Months ago I bought her an Aspen collar. She is waiting for a May appointment with my neurosurgeon. Every time I see her I feel a form of post traumatic stress, because I want to give her all the access I’ve had. Her story may look very different than mine. Knowing all I know I just want to hand her any relief I can. I am feeling compassion fatigue. God is showing me the best and most beautiful way I can help is finish this book. This is why I stopped writing at Team Danica and moved here. It is also why at the beginning of the year I will have to turn off notifications from the support groups, silence my phone and do the very hard work of retelling our story along with detailed medical information and vignettes of the caring physicians and other patients who have saved us, all heroes untying our knots. I was blown away by the nominations posted in the comments of my Big Box Giveaway. If you haven’t read them take a stroll over there. I know I said no more giving this year, but I was inspired to do one more after all the talks I had last week. 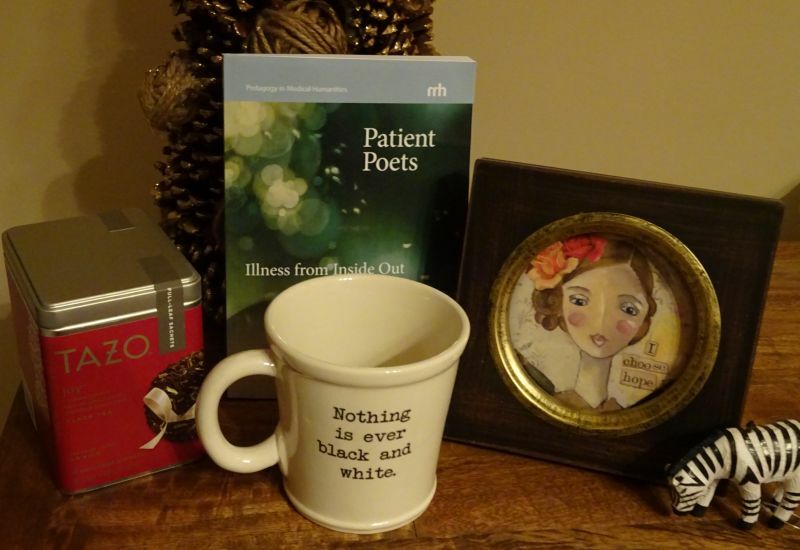 Included is a beautiful piece of Kelly Rae Roberts art framed and behind glass with the message “I choose hope.” A copy of Marilyn Chandler McEntyre’s book Patient Poets, mentioned above. A Zebra mug like the one my sister recently gifted me. It has a zebra on the front and our motto on the back, “Nothing is ever black and white.” Also my favorite Tazo tea, Joy. a perfect blend of black and white tea and a little zebra ornament for the tree. Oh how difficult the holidays are for us! Here’s how to enter for the special zebra gifts you see here to be mailed to one of your own heroes. 1. Comment below on this post about an EDS or Chiari hero who has inspired you and helped untie your impossible knots. I will be randomly choosing a winner after midnight Thursday so I can mail this care package on Friday. 2. Many of you are personal friends on my Monica Roberts Snyder facebook page or followed Team Danica. Click on the facebook link at the top right of this blog and “like” my new writer page. This is where you will get updates on the progression and publication of Gauntlet with a Gift. Subscribe to receive new blog posts by email on the right side of this post. 3. Share this with your zebra friends! Our Hope remains! So very rich with wisdom, beauty & love Monica. Thank you for being “you”. For risking, for extending yourself in this capacity, even to the point of becoming compassion weary. I’m very familiar with that cloak. I pray it releases healing to you in ways you’ve not imagined possible. I would like to nominate Robin Armstrong Griffith for this give away. She is exemplary of living a sacrifical life for the sake of others. I’m amazed at her strength and zeal to educate & raise awareness in the midst of her own enormous trials. Because of her extension of caring, to me a stranger, I now know & have answers to chronic illness questions of over 20 years. Her one response to me has opened doors & avenues of healing I never dreamed possible. Thank you Robin from the bottom of my heart. And thank Monica for this ocean of love waves you are creating, facilitating….may they wash back over you & yours, again & again. Amen. My apologies, I hit submit before verifying the correct spelling of Robin’s last name. I always get it confused. It is Robin Griffin. I call her my “Zebra Angel Girl”. I had moved to a new city. My family has already rejected a Gentiscits diagnosis. No friends, no one to talk, feeling alone on my journey. I felt desperate enough, that the thought of taking my life, was on my plate. I felt alone and helpless not knowing how I was going to make it alone. Shannon Bowers was drawing my blood as I tell her “I just got a bizarre diagnosis”. She says “its Elhers Danlos Syndrome right”. I said “how do you know that”. “Because I have it too”. I broke down and cried right then. I thought my world had been crushed by a family who rejected me and alone in a city I did not know. She gave me reassurance that I was not alone on my rare journey and that it is a real medical issue. She gave me Facbook pages to join. Internet sites to look up. Introduced me to other Zebras and became an instant friend when I thought my world was and still is against me. My world only changed in that, I gained a friend who became closer than a sister. She is my hero. Sense then I have found many Zebra friends but she will always be my “Zebra Angel Girl”. Sense that time I have been confirmed EDS by my Rumitololigist, my pain management, aquatic therapy, and the list goes on. Even after all this conformation, and family members who work in the medical field, they still do not believe I have EDS. I have been adopted as Aunt by some of my Zebra friends and spend holidays with my adopted families. I don’t know what I might have done had it not been for the sweetest caring person I could have ever met, Shannon Bowers. Thank you for opening up to a stranger and sharing your life with me. Thank you for all the help you give me. Thank you for your kindness in being there when I needed to be loved the most. You will forever be in my heart, tucked away, with the other heroes in my life. I may have not been sent an angelic being from heaven but I believe there are angels on earth that alow the heavens to open up to people in need. Shannon Bowers you are my “Zebra Angel Girl”. I nominate Kim DeAngelo while she does not have EDS she guided me into finding answers pushing me until I found those answers! Because of her, I decided to pursue getting genetics testing done and I found out I had EDS! She lent me her virtual shoulder to cry on and sometimes it was her shoulder when I was passing through Columbus. This woman is a saint and wants nothing more than to help even we she is down and out she helps me… I often forget she is sick too but she never says no and always listens. Everyone needs a person like that in their journey and I hope everyone can find that person. I was alone and scared and she helped me see the light that it can be better. I would like to nominate my amazing friend Amy Augustyn. She is always there when I need someone to talk to, always has advice for me, always gives me a reality check when I need one. She has made my difficult journey through all this mess of EDS and all it’s complications a little easier. She helps many others on Beyond the Measurement, even when dealing with her own health challenges and complications. She is my zebra warrior and Chiari sister and my life would not be the same without her. I would be very very lost without her. She knows when to make me laugh, lets me cry when I need to, we can talk about anything and everything for hours. I literally cannot imagine my life without her. I nominate my daughter, Kilynn. She has EDS and it took us many years to get the diagnosis. In January it will be 4 years since she was diagnosed. She is my hero. she fights through the pain to conitnue her dream of being a cheer leader. She also approached the school she attends last year and asked if they would do an E.D.S. awareness night. They agreed and will be holding the second annual E.D.S. awareness night at her school on January 13, 2015. She has stepped up to educate others of what E.D.S. is and to try to encourage others with it to stand up and advocate also. This year she has reached out to invite other area schools, 7 in all to also be a part of the night. Even if they don’t participate she has handed out information on E.D.S to over 200 others and is getting facts about it published in a local magazine to eduacte even more. She is my beautiful teenaged daughter but also my hero. It is hard to see her go through so much at such a young age but she has a heart to bring awareness to help others now and hopefully help find a cure for those in the future! Monica, I couldn’t find the words yesterday, but wanted to thank you for the gift of your friendship, your willingness to write Gauntlet with a Gift, the way you so beautifully love on, encourage and inspire others. My zebra heroes are my kids — sweet, tough, resilient, courageous, intelligent, creative, witty, incredible teens who choose every, single day to start again. I am awed by their courage, humbled by their resilience, and deeply blessed to be their mom. Jamie Cameron. I’d not have made it this far through the madness without the two of you. Thank you for sharing your gift – to connect us with your words, to explain to others the reality of the “life of a zebra”, and for helping to guide many who are struggling to find a path through the medical maze. You give so much for us and YOU are a true angel and hero to so many – including to me. Despite the significant challenges of this condition, the relationships formed in support groups in person and online and through fundraising walks have been an unexpected blessing. There are so many loving people who are willing to research and pray and support. I have met so many through this process that I wish could receive the blessing of this gift! Thank you for highlighting Robin. She has spent countless hours over the past four years individually supporting patients and parents of children with these conditions. Her goal is simply to educate and help others avoid misdiagnosis. She is a hero and I’m thrilled that she was nominated. There are two others that I would like to nominate – individuals who reached out and made a significant difference very early in my journey – and I know in the journeys of so many others. Days before one of her surgery a few years ago, Pam Fenner contacted me to personally answer a question that I had posted about my daughter. She has continued to support and guide and pray for us in so many ways. I am so grateful. She graciously gives so much of herself to others in support groups, through CSF meetings, and through her participation In The Coalition Against Pediatric Pain, and We Heart Harlie and Friends. I am incredibly grateful for her thoughtful guidance, suggestions, and prayers. Pam Fenner is a true zebra hero. Matt Osinski is another zebra hero who has given so much of his time to help our family prepare for appointments, review imaging, determine which specialists to contact and in which order. He has answered questions via text before I can type them — as he knew exactly what I was going to ask. His positive encouragement to so many people is incredibly inspiring – despite the medical challenges of his family members. He models how to respectfully advocate for family members, how to research, and how to find the positive in everyday despite pain. He is a true zebra hero and my family is grateful for his support! Without question, Pamela Fenner. She has been an invaluable source of information and support to me!!! Thank you for sharing these beautiful nominations. In this difficult journey we have been given gifts of wonderful relationship with one another. Celebrating this good in so much hard is important. I entered all the names in a random name picker program. Pam Fenner and Robin Griffin were entered twice. Amy Augustyn is the winner. She was nominated by Julie Hill. I would encourage you all to copy and paste your nomination and email or message it to the person you mentioned. Words of affirmation are one of the best way we encourage in all this. Much love to each of you. I am grateful to share in this suffering with such brave and beautiful people. Our Hope remains!